“KAWS” is a graffiti artist, illustrator, painter, sculptor, product designer, and toymaker. His cartoonish style—including his best-known characters with X-ed out eyes—has its roots in his early career as a street artist, when he began replacing advertisements with his own, masterful acrylic paintings in the early 1990s. Brian Donnelly is currently best known as the artist KAWS and is a New York-based artist who has made a name out of him designing limited edition toys and clothing. He is also a world-renowned artist who exhibits in museums and galleries internationally. His art stands somewhere between fine art and global commerce. 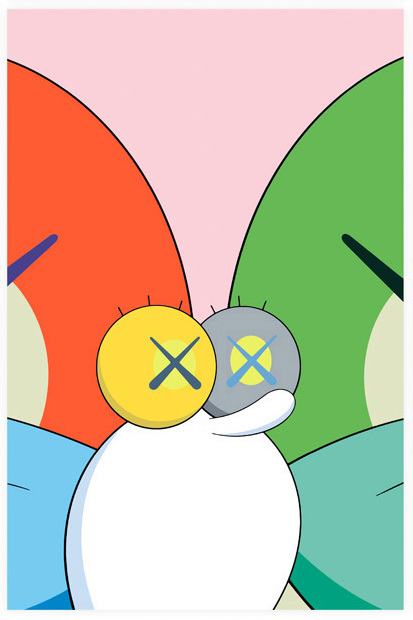 KAWS moved beyond the sphere of the exclusive art market to occupy a more complex global market. Brian Donnelly was born in 1974 in Jersey City, New Jersey. He graduated from the School of Visual Arts in New York where he obtained a Bachelor of Fine Arts in illustration. After graduating from college in 1996, Brian Donnelly worked for Disney as a freelance animator. At Disney, Brian Donnelly had the opportunity to paint backgrounds and contributed in films such as 101 Dalmatians, Daria, and Doug. While living in Jersey City, KAWS began his career as a graffiti artist. By the early 1990s he moved to New York City and began to work focus on subverting the images on bus shelters, phone booth advertisements, and billboards. Soon after his notoriety and popularity reached heights never before expected and these ads became increasingly sought after by the public. In the late 1990s, KAWS had an opportunity to design and produce limited edition vinyl toys. These toys instantly became a hit with the global art toy-collecting community. In Japan, the toys were a major his since this genre of toys is well respected and widespread. Most recently KAWS has designed toys and clothing for well-known companies such as Original Fake, A Bathing Ape, Undercover, Kung Faux, Nike, Vans, and Comme des Garcons . In the early 2000s he also reworked many familiar television and cartoon icons such as characters from The Simpsons, Mickey Mouse, the Michelin Man, the Smurfs, and even SpongeBob SquarePants. He has also been highly praised for his work on acrylic paintings and large sculptures. One of the more popular KAWS sculpture is that of a gray scale figure based on the Mickey Mouse whose face is obscured by his both hands. This image was even incorporated into a balloon for the 2012 Macy’s Thanksgiving Day Parade. In 2013, KAWS’s company redesigned MTV’s moon man statue for their 2013 MTV Video Music Awards. KAWS museum exhibitions include solo shows at the Pennsylvania Academy of Fine Arts, High Museum of Art, Modern Art Museum, and the Aldrich Contemporary Art Museum. Other international galleries include Galerie Perrotin and Honor Fraser Gallery. His work has been seen in Paris, London, Berlin, and Tokyo. KAWS currently lives and works in Brooklyn.